A handle which has a port for insertion and removal of stylet as well as for creating negative suction pressure during FNA. Fanning technique: In this technique, needle is positioned at different areas within the mass and then moved to and fro multiple times in each area. 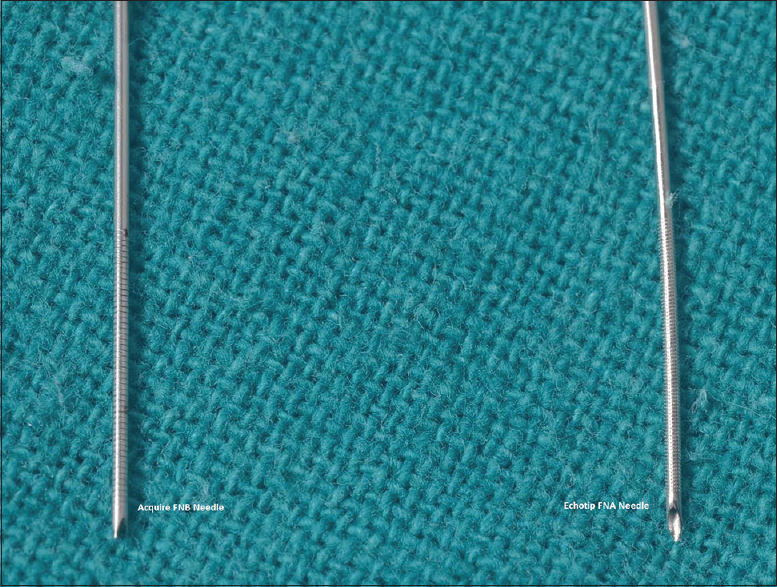 The needle path can be altered using either the “up/down” endoscope dial or the elevator. In a recent randomized controlled trial which compared the standard technique versus fanning technique, authors found no difference in diagnostic accuracy, technical failure, or complication rates. However, fanning technique required lesser number of passes to establish the diagnosis with a higher percentage of patients achieving diagnosis on pass one (57.7% vs. 85.7%; P = 0.02). We routinely use fanning technique in our clinical practice. Using stylet which is more controlled as material is expelled drop by drop is preferred by most endosonologists. Alcohol fixation: As soon as the slides are prepared and still wet, they are immersed in ethanol or sprayed on. These slides are stained with Papanicolaou stain. In centres with low sample adequacy of EUS FNA and nonavailability of ROSE. Various other designs of EUS FNB needles to improve upon the diagnostic yield have been developed over the last few years [Figure 2]. These hollow FNB needles can be either noncutting or cutting needles. The cutting needles include either side-type cutting (e.g., Tru-Cut or ProCore) or end-type cutting (such as Franseen and fork-tip). The end cutting type needles are the recent introduction to the EUS armamentarium. 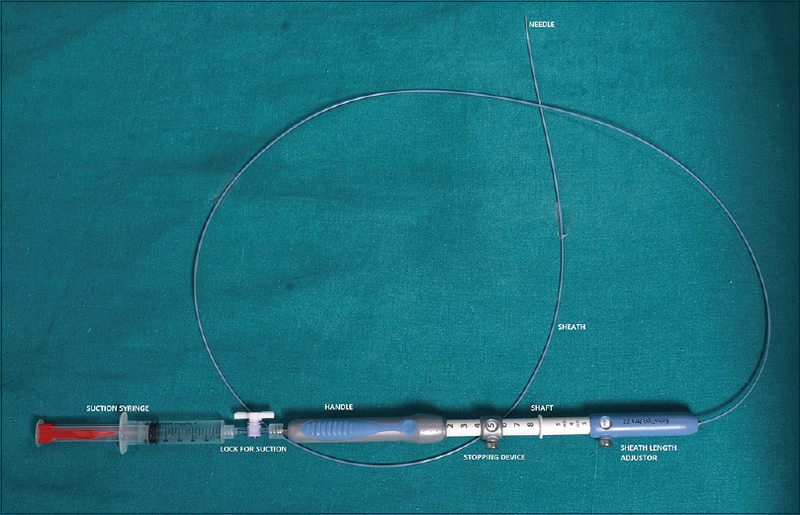 The two most recently introduced EUS FNB needles are Franseen needle (Acquire, Boston Scientific) and fork-tip needle (SharkCore™, Medtronic) and the initial studies with these new needles are very encouraging [Figure 3]. However, the current data comparing various EUS FNB core needles for sample adequacy, diagnostic accuracy, and acquisition of a core specimen is scanty. The newly developed EUS-FNB needles are expensive than the first-generation needles and need more robust evidence of superiority than what is currently available before they can be widely used. However, still there is limited data to suggest that the use of FNB with adequate core tissue material may be performed without ROSE and therefore may replace FNA. Sample is placed on a glass slide and with the help of needle is microdissected to form tissue cores. DiMagno EP, Buxton JL, Regan PT, Hattery RR, Wilson DA, Suarez JR, et al. Ultrasonic endoscope. Lancet 1980;1:629-31. Vilmann P, Jacobsen GK, Henriksen FW, Hancke S. Endoscopic ultrasonography with guided fine needle aspiration biopsy in pancreatic disease. Gastrointest Endosc 1992;38:172-3. Wiersema MJ, Hawes RH, Tao LC, Wiersema LM, Kopecky KK, Rex DK, et al. Endoscopic ultrasonography as an adjunct to fine needle aspiration cytology of the upper and lower gastrointestinal tract. Gastrointest Endosc 1992;38:35-9. Roy AK, Kim M, Hawes R, Varadarajulu S. 196 changing trends in tissue acquisition in pancreatic diseases. Gastrointest Endosc 2013;77:AB134. Cazacu IM, Luzuriaga Chavez AA, Saftoiu A, Vilmann P, Bhutani MS. A quarter century of EUS-FNA: Progress, milestones, and future directions. Endosc Ultrasound 2018;7:141-160. Affolter KE, Schmidt RL, Matynia AP, Adler DG, Factor RE. Needle size has only a limited effect on outcomes in EUS guided fine needle aspiration: A systematic review and meta-analysis. Dig Dis Sci 2013;58:1026-34. Madhoun MF, Wani SB, Rastogi A, Early D, Gaddam S, Tierney WM, et al. The diagnostic accuracy of 22-gauge and 25-gauge needles in endoscopic ultrasound-guided fine needle aspiration of solid pancreatic lesions: A meta-analysis. Endoscopy 2013;45:86-92. Rong L, Kida M, Yamauchi H, Okuwaki K, Miyazawa S, Iwai T, et al. Factors affecting the diagnostic accuracy of endoscopic ultrasonography-guided fine-needle aspiration (EUS-FNA) for upper gastrointestinal submucosal or extraluminal solid mass lesions. Dig Endosc 2012;24:358-63. Wee E, Lakhtakia S, Gupta R, Sekaran A, Kalapala R, Monga A, et al. Endoscopic ultrasound guided fine-needle aspiration of lymph nodes and solid masses: Factors influencing the cellularity and adequacy of the aspirate. J Clin Gastroenterol 2012;46:487-93. Ramesh J, Bang JY, Hebert-Magee S, Trevino J, Hasan M, Logue AL, et al. Multi-center randomized trial comparing the 19G and 25G needles for EUS-guided FNA of solid pancreatic mass lesions [abstract]. Gastrointest Endosc 2013;77:AB1022. Song TJ, Kim JH, Lee SS, Eum JB, Moon SH, Park DY, et al. The prospective randomized, controlled trial of endoscopic ultrasound-guided fine-needle aspiration using 22G and 19G aspiration needles for solid pancreatic or peripancreatic masses. Am J Gastroenterol 2010;105:1739-45. Itoi T, Itokawa F, Sofuni A, Nakamura K, Tsuchida A, Yamao K, et al. Puncture of solid pancreatic tumors guided by endoscopic ultrasonography: A pilot study series comparing Trucut and 19-gauge and 22-gauge aspiration needles. Endoscopy 2005;37:362-6. Wani S, Muthusamy VR, Komanduri S. EUS-guided tissue acquisition: An evidence-based approach (with videos). Gastrointest Endosc 2014;80:939-59.e7. Wani S, Early D, Kunkel J, Leathersich A, Hovis CE, Hollander TG, et al. Diagnostic yield of malignancy during EUS-guided FNA of solid lesions with and without a stylet: A prospective, single blind, randomized, controlled trial. Gastrointest Endosc 2012;76:328-35. Rastogi A, Wani S, Gupta N, Singh V, Gaddam S, Reddymasu S, et al. A prospective, single-blind, randomized, controlled trial of EUS-guided FNA with and without a stylet. Gastrointest Endosc 2011;74:58-64. Sahai AV, Paquin SC, Gariépy G. A prospective comparison of endoscopic ultrasoundguidedfine needle aspiration results obtained in the same lesion, with and without the needle stylet. Endoscopy 2010;42:900-3. Bang JY, Magee SH, Ramesh J, Trevino JM, Varadarajulu S. Randomized trial comparing fanning with standard technique for endoscopic ultrasound-guided fine-needle aspiration of solid pancreatic mass lesions. Endoscopy 2013;45:445-50. Lee JK, Choi JH, Lee KH, Kim KM, Shin JU, Lee JK, et al. A prospective, comparative trial to optimize sampling techniques in EUS-guided FNA of solid pancreatic masses. Gastrointest Endosc 2013;77:745-51. Puri R, Vilmann P, Saftoiu A, Skov BG, Linnemann D, Hassan H, et al. Randomized controlled trial of endoscopic ultrasound-guided fine-needle sampling with or without suction for better cytological diagnosis. Scand J Gastroenterol 2009;44:499-504. Wallace MB, Kennedy T, Durkalski V, Eloubeidi MA, Etamad R, Matsuda K, et al. Randomized controlled trial of EUS-guided fine needle aspiration techniques for the detection of malignant lymphadenopathy. Gastrointest Endosc 2001;54:441-7. Bang JY, Hebert-Magee S, Hasan MK, Varadarajulu S. Randomized trial comparing the 22 and 25 gauge Needles using the suction-in and no-suction (sins) techniques for EUS-guided FNA of pancreatic masses. Gastrointest Endosc 2017;85:AB328. Lee JM, Lee HS, Hyun JJ, Lee JM, Yoo IK, Kim SH, et al. 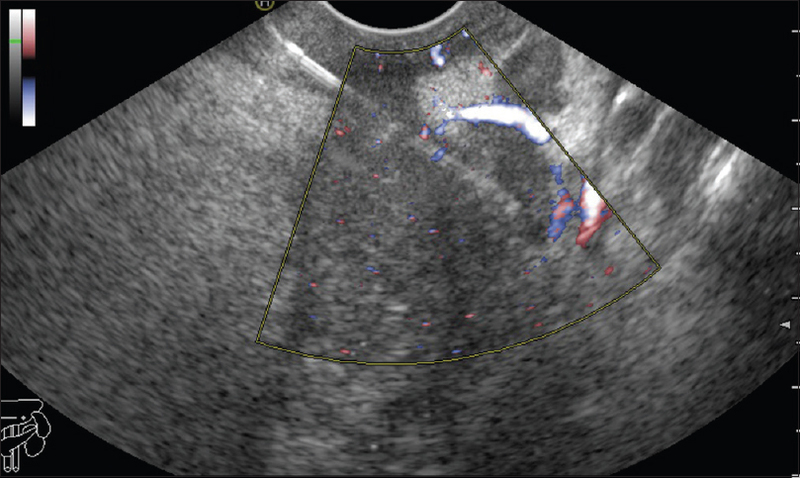 Slow-pull using a fanning technique is more useful than the standard suction technique in EUS-guided fine needle aspiration in pancreatic masses. Gut Liver 2018;12:360-6. Klapman JB, Logrono R, Dye CE, Waxman I. Clinical impact of on-site cytopathology interpretation on endoscopic ultrasound- guided fine needle aspiration. Am J Gastroenterol 2003;98:1289-94. Erickson RA, Sayage-Rabie L, Beissner RS. Factors predicting the number of EUS-guided fine-needle passes for diagnosis of pancreatic malignancies. Gastrointest. Endosc 2000;51:184-90. Iglesias-Garcia J, Dominguez-Munoz JE, Abdulkader I, Larino-Noia J, Eugenyeva E, Lozano-Leon A, et al. Influence of on-site cytopathology evaluation on the diagnostic accuracy of endoscopic ultrasound-guide fine needle aspiration (EUS-FNA) of solid pancreatic masses. Am J Gastroenterol 2011;106:1705-10. Kulesza P, Eltoum IA. Endoscopic ultrasound-guided fine needle aspiration: Sampling, pitfalls, and quality management. Clin Gastroenterol Hepatol 2007;5:1248-54. Wani S, Mullady D, Early DS, Rastogi A, Collins B, Wang JF, et al. The clinical impact of immediate on-site cytopathology evaluation during endoscopic ultrasound-guided fine needle aspiration of pancreatic masses: A prospective multicenter randomized controlled trial. Am J Gastroenterol 2015;110:1429-39. Hebert-Magee S, Bae S, Varadarajulu S, Ramesh J, Frost AR, Eloubeidi MA, et al. The presence of a cytopathologist increases the diagnostic accuracy of endoscopic ultrasound-guided fine needle aspiration cytology for pancreatic adenocarcinoma: A meta-analysis. Cytopathology 2013;24:159-71. Schmidt RL, Witt BL, Matynia AP, Barraza G, Layfield LJ, Adler DG. Rapid on-site evaluation increases endoscopic ultrasound-guided fine-needle aspiration adequacy for pancreatic lesions. Dig Dis Sci 2013;58:872-82. Gleeson FC, Clayton AC, Zhang L, Clain JE, Gores GJ, Rajan E, et al. Adequacy of endoscopic ultrasound core needle biopsy specimen of nonmalignant hepatic parenchymal disease. Clin Gastroenterol Hepatol 2008;6:1437-40. DeWitt J, Cho CM, Lin J, Al-Haddad M, Canto MI, Salamone A, et al. Comparison of EUS-guided tissue acquisition using two different19-gauge core biopsy needles: A multicenter, prospective, randomized, and blinded study. Endosc Int Open 2015;3:E471-8. Cheng B, Zhang Y, Chen Q, Sun B, Deng Z, Shan H, et al. Analysis of FNB vs FNA in diagnosis of pancreatic and abdominal masses: A prospective, multicenter, randomized controlled trial. Clin Gastroenterol Hepatol 2018;16;1314-21. Bang JY, Hawes R, Varadarajulu S. A meta-analysis comparing ProCore and standard fine-needle aspiration needles for endoscopic ultrasound-guided tissue acquisition. Endoscopy 2016;48:339-49. James TW, Baron TH. A comprehensive review of endoscopic ultrasound core biopsy needles. Expert Rev Med Devices 2018;15:127-35. Moller K, Papanikolaou IS, Toermer T, Delicha EM, Sarbia M, Schenck U, et al. EUS-guided FNA of solid pancreatic masses: High yield of 2 passes with combined histologic-cytologic analysis. Gastrointest Endosc 2009;70:60-9. Wang KX, Ben QW, Jin ZD, Du YQ, Zou DW, Liao Z, et al. Assessment of morbidity and mortality associated with EUS-guided FNA: A systematic review. Gastrointest Endosc 2011;73:283-90. Gress F, Michael H, Gelrud D, Patel P, Gottlieb K, Singh F, et al. EUS-guided fine-needle aspiration of the pancreas: Evaluation of pancreatitis as a complication. Gastrointest Endosc 2002;56:864-7. Affi A, Vazquez-Sequeiros E, Norton ID, Clain JE, Wiersema MJ. Acute extra-luminal hemorrhage associated with EUS-guided fine needle aspiration: Frequency and clinical significance. Gastrointest Endosc 2001;53:221-5. Janssen J, Konig K, Knop-Hammad V, Johanns W, Greiner L. Frequency of bacteremia after linear EUS of the upper GI tract with and without FNA. Gastrointest Endosc 2004;59:339-44. Barawi M, Gottlieb K, Cunha B, Portis M, Gress F. A prospective evaluation of the incidence of bacteremia associated with EUS-guided fine-needle aspiration. Gastrointest Endosc 2001;53:189-92. Fujii LL, Levy MJ. Basic techniques in endoscopic ultrasound-guided fine needle aspiration for solid lesions: Adverse events and avoiding them. Endosc Ultrasound 2014;3:35-45. Konda VJ, Meining A, Jamil LH, Giovannini M, Hwang JH, Wallace MB, et al. A pilot study of in vivo identification of pancreatic cystic neoplasms with needle-based confocal laser endomicroscopy under endosonographic guidance. Endoscopy 2013;45:1006-13. Krishna SG, Modi RM, Kamboj AK, Swanson BJ, Hart PA, Dillhoff ME, et al. In vivo and ex vivo confocal endomicroscopy of pancreatic cystic lesions: A prospective study. World J Gastroenterol 2017;23:3338-48. Nakai Y, Isayama H, Chang KJ, Yamamoto N, Mizuno S, Mohri D, et al. A pilot study of EUS-guided through-the-needle forceps biopsy (with video). Gastrointest Endosc 2016;84:158-62. Pham KD, EngjomT, Gjelberg Kollesete H, Helgeland L. Diagnosis of a mucinous pancreatic cyst and resection of an intracystic nodule using a novel through-the-needle microforceps. Endoscopy 2016;48 (Suppl. 1):E125-6. Khurana KK, Graber B, Wang D, Roy A. Telecytopathology for on-site adequacy evaluation decreases the nondiagnostic rate in endoscopic ultrasound-guided fine-needle aspiration of pancreatic lesions. Telemed J E Health 2014;20:822-7.